Our collection of funny Ezekiel Elliott Fantasy Football Names will give you some things to think about if you were lucky enough to draft this phenomenal back. At Ohio State University, he was second only to the famous Archie Griffin in terms of career yards and yards per game. The fourth overall pick in the draft by the Dallas Cowboys, Elliott had a sensational rookie season earning all-pro honors. Only 21 years old as a rookie, he looks to have many great seasons ahead of him. 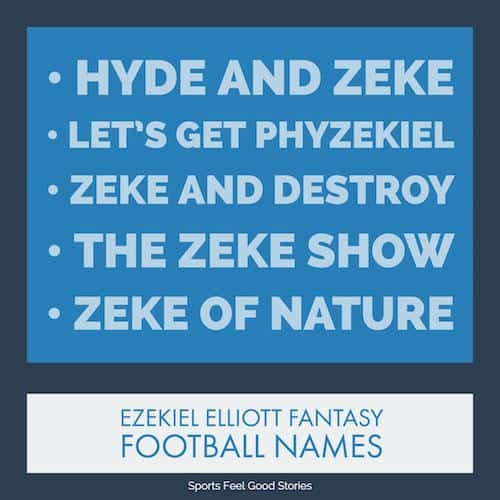 Check out our cool and funny Ezekiel Elliott fantasy names. Zeke and Ye Shall Find the End Zone. Check out Fantasy Football Sleepers 2019. Elliott’s parents were both accomplished athletes. He mother Dawn ran track at the University of Missouri and his father Stacy was a linebacker for the Tigers’ football team at Missouri. Despite pressure to play at the University of Missouri, Elliott chose Ohio State University for his college. He earned second team All-American honors as a Buckeye. If you have any suggestions for cool and funny Ezekiel Elliott fantasy team names, please let us know via our Contact page. Thanks! Elliott surpassed both Tony Dorsett and Herschel Walker by rushing for 1,631 yards in his rookie season. That total also led the NFL.